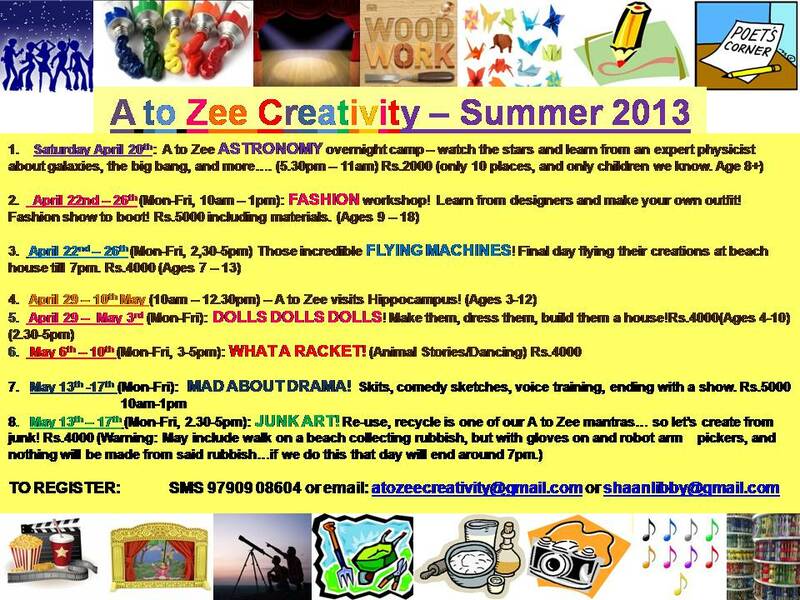 A to Zee Creativity: Summer Camps 2013! Register now! Summer Camps 2013! Register now! A to Zee Summer Camps! 2. Mon April 22 – Fri April 26: Those maginificent flying machines! (Ages 7-13, 2.30 - 5pm; final day at beach house so 7pm pick up. 7. 13 May – 17 May (Mon-Fri, 2.30-5pm): Junk Art. Re-use, recycle is one of our mantras…so let’s create from junk! All ages - varying levels of difficulty possible. 5.30pm: Drop off with sleeping bag, pyjamas, tooth brush, change of clothes, torch, mini telescope if you have one. We have one large telescope. 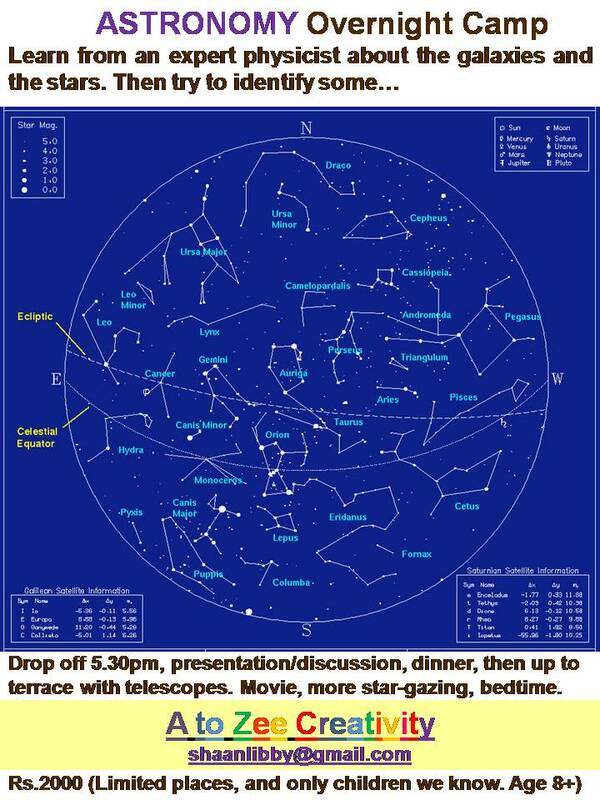 6pm: The children will watch a presentation and learn about the stars, the constellations, and we will have a short group quiz on these. All led by an expert Physicist Dr.Jim Libby. 7.45pm: Mosquito repellant and a silent trip to the terrace with five adults in tow…setting up telescopes and viewing the stars. We will spread mats out for those who wish to lie flat and view them. 9pm: queue for the bathroom – changing into pyjamas, laying out sleeping bags inside the room with the AC on (luxury camping) - there will be a maid outside on the verandah (poor soul) - beneath a mosquito net...others wanting to attempt sleeping beneath the stars under tents or mosquito net tents - please bring them and do so. Please do not worry - we will be sleeping in the bedroom beside the children on the same floor as them. All your telephone numbers will be up on at least 3 tackboards in case we need to contact you. 8am: Chocolate milk, brush teeth, sit around the table for breakfast cereal, omelettes, sausages, toast, jam, marmalade, fruit…. 8.30am: Queue for the bathroom – quick showers if desired – else change of clothes. 9.30am: Astronomy-related board games – and others. Writing down their experiences and which stars they spotted. 11am: Home time with individual charts of the constellations to put on their bedroom walls. Aeroplanes, kites, boomerangs, parachtes, and all things inbetween that are airborne is our theme. We will chart the history and evolution of flying machines from the Wright brothers to today’s supersonic aircrafts and rockets. 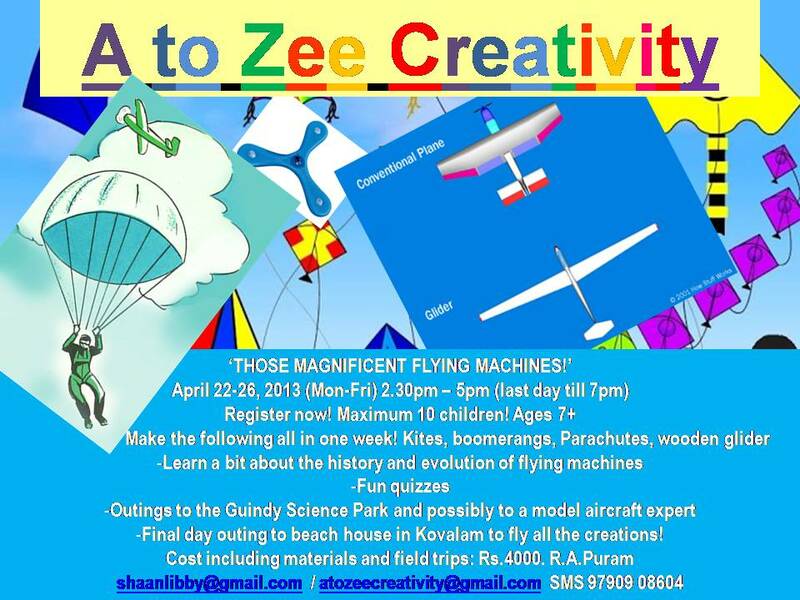 Our A to Zee art expert will be guiding the children in making their very own different flying machine each day. We plan to fly the kites on the beach on the last day of the camp…most likely at our beach house in Kovalam if that is alright by the parents. Also one field trip to the Science Museum in Guindy to the aircraft section is in the plan – they have some excellent displays. Snack included each day. For all the little girls and boys who enjoy making things - we will be making paper dolls - fairies, pirates, kings and queens, and princesses of course! You could also bring in your favourite paper dolls, and we will make lots of tiny clothes to fit. We will also help make a cardboard dolls house/ship for each child to take home. Our A to Zee art expert will help you create dolls house furniture and to create and cut out paper dolls, and make clothes for them that you can cut out and colour or paint. Snack included each day. Bring with you: Cardboard boxes of different shapes and sizes for the dolls house. Several shoe boxes would be ideal, and even little boxes like toothpaste boxes, empty matchboxes, etc. Start collecting now! For lots of singing and dancing…we will have the little ones singing lots of Animal-related children’s songs, while our A to Zee dance choreographers will get them all having a blast dancing freestyle with lots of leaping, hopping, slithering, kicking, and wiggling thrown in for good measure !